The Mississippi River looms large in the American identity, from the history and literature taught in schools to the nation’s modern economy. In New Orleans, you can easily experience the river in all its bustling activity, natural splendor and historical significance via the riverfront area adjacent to the French Quarter. Sweeping vistas, public art, family activities and jumping-off points for riverboat tours are all clustered here along a linear park and walkways. 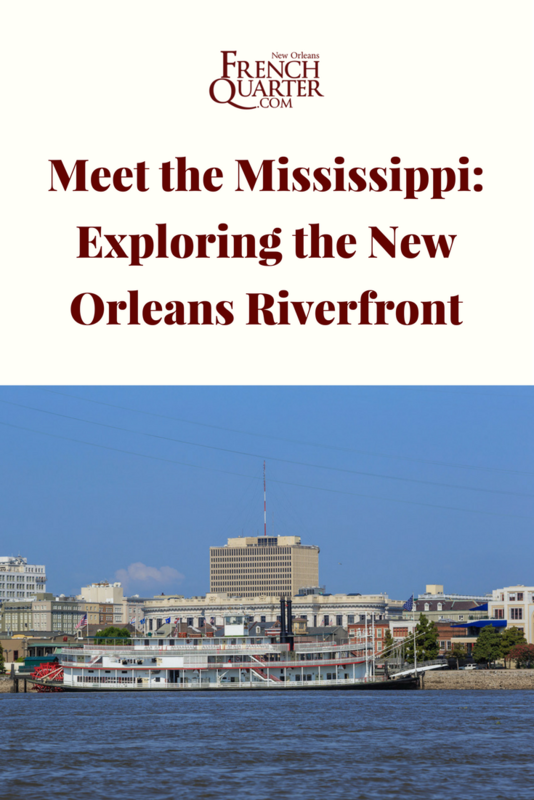 The Mississippi has always been a working river and for generations most New Orleanians were cut off from any access to it by floodwalls, warehouses and very busy wharves. That began to change in the 1970s through the 1980s, as underused industrial buildings near the French Quarter were razed and replaced by Woldenberg Park, a grassy open space named for local philanthropist Malcolm Woldenberg, and the Moonwalk, a walkway named for the former New Orleans mayor Maurice “Moon” Landrieu. Today the area attracts an estimated 7 million visitors annually, according to the Audubon Institute, the organization which runs it. 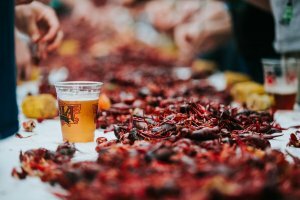 A great place for a picnic of po-boys or local seafood, a jog or just to catch a cooling breeze on a typically humid New Orleans day, this mile-long stretch of the riverfront is also the setting for many community celebrations and special events. 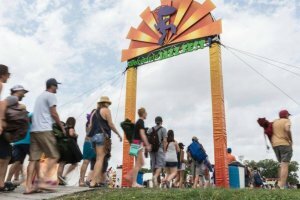 For example, the largest stages for the annual French Quarter Festival (www.frenchquarterfestival.org) are set up here each spring and the park is prime real estate for viewing fireworks during the city’s Fourth of July activities, known collectively as Go Fourth on the River. A bronze statue of Malcolm Woldenberg in the park that bears his name is one exhibit in what has grown into an informal sculpture garden along the riverfront. Near the philanthropist’s statue is a stainless steel sculpture called “Ocean Song.” Created by local artist John Scott, the piece depicts the motion of water in eight narrow pyramids, polished to a reflective gleam. Further downriver is the elegant “Monument to the Immigrant,” crafted from white Carrara marble by sculptor Franco Allesandrini. The work faces the riverfront with a ship’s prow topped by a female figure reminiscent of Lady Liberty, while behind her stands a turn-of-the-century immigrant family looking toward the French Quarter. A few blocks downriver is Robert Schoen’s “Old Man River,” a stone human figure also made from Carrara marble. Weighing in at 17 tons and standing 18 feet high, the statue speaks to the river’s power and majesty in its rounded, circular body forms. The most recent addition to this collection of public art is the city’s Holocaust Memorial, which was dedicated in 2003. Created by Israeli artist and sculptor Jacob Agam, the memorial is often described as a “living work” because its images and shapes change as a visitor walks around it. Vestiges of the area’s industrial past remain, like the warehouses and wharves that begin behind the French Market and the freight trains that still rumble along a corridor between the river and the French Quarter. Much gentler rail traffic comes in the form of the city’s red Riverfront streetcars, built in 1988 with a vintage look and modern amenities to carry passengers from Canal Street to the lower end of the French Quarter. Past the French Market, going along St Peters St, one can spy the latest pedestrian-friendly addition to the city’s riverfront real estate: the entrance to the Crescent Park, an unmissable pedestrian footbridge linked to the ground by an elevator and staircase. The Crescent Park plays with the city’s shipping heritage, drawing upon that legacy to create a severe, post-industrial aesthetic that includes open air pavilions, concrete buttresses, long walking and cycling paths, and rusted metal features like a pedestrian bridge, all laid out in a linear park that runs from Faubourg Marigny through the Bywater. Using the Crescent Park’s linear pathway, you can walk all the way from N Peters and Marigny St to Chartres and Bartholomew St. Anywhere you go on the river, you’re likely to spot modern shipping traffic. The ports, refineries and terminals clustered between the mouth of the river and Baton Rouge to the north make the Mississippi one of the world’s busiest rivers, and from a bench along the riverfront visitors can watch as tugs, tankers, freighters, cruise ships and long strings of barges navigate its currents. Street musicians usually perform nearby for tips, adding to the ambiance with their saxophones or trumpets. Indeed, from the French Quarter, visitors can see with their own eyes how New Orleans earned the nickname the Crescent City as large vessels follow the dramatic turn in the river upon which the French Quarter is situated. If all these maritime vistas give you the urge to use your sea legs, the Steamboat Natchez (504-569-1401) will take you out on the muddy Mississippi and offers tours of varying length and themes. 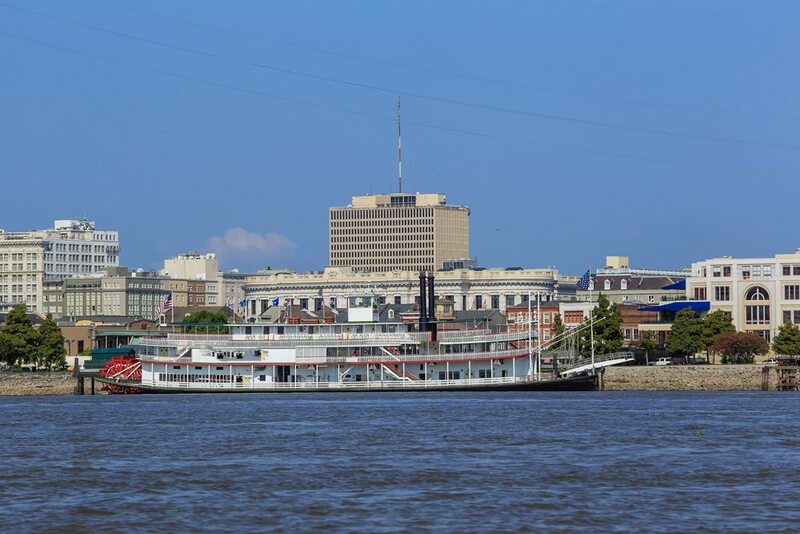 Designed to resemble the old steamships that once brought cotton, gamblers and jazz up and down the river, this modern vessel gives today’s visitors a way to experience the Mississippi up close and view the city’s skyline and intricate French Quarter roof-scape from the river. Back on dry land, the riverfront area is also home to two of the city’s most popular family attractions, the Audubon Aquarium of the Americas and the Entergy Imax Theater (both at 1 Canal St., 800-774-7394). The active area outside these facilities is filled with whimsical sculptures of marine life, well-shaded park benches and outdoor vendors serving light refreshments. Just upriver from the aquarium area is the Spanish Plaza. Dedicated in 1976 during the U.S. bicentennial, the plaza was a gift from Spain in a gesture of friendship to its one-time colony. It features a large fountain ringed by tile mosaics of Spanish coats of arms representing that country’s provinces. Vendors in the plaza serve smoothies and snacks, while the Riverwalk Marketplace Mall is just next door for air-conditioned shopping.